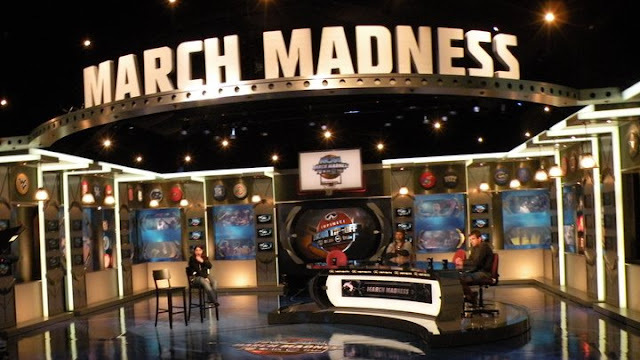 Pre-Tourney Setup: The NCAA March Madness set for Tonight's TruTV coverage. Photo courtesy of NCAA Men's Basketball March Madness Facebook Page. 1. The set looks sharp and lends itself to a nice conversational tone between and amongst the talent. 2. I can't remember the last time Jim Nantz has called a non-Championship basketball game on a weeknight and NOT on CBS. 3. The trademark CBS Blue Blazers look awfully naked without the CBS Sports patch on the breast pocket. It just looks too bland. If they don't want to have CBS branding on a TruTV broadcast, replace it with something to help brand the broadcast. 4. The audio levels on the booth talent are widely inconsistent. When Jim Nantz is talking, it is loud and clear. When it switches to Clark Kellogg and Steve Kerr, it sounds like they are in the mud. 5. The three-man booth does not work for a First Four game, but they have to work on their on-air chemistry someplace. Right now though, it sounds to unnatural and forced. 6. For fans not familiar with the teams playing, they could through an occasional graphic up (maybe as a stats line in the score bug) showing the jersey colors. 7. Turner Sports has designed the graphics package that will be used on all four networks. For the most part they look sharp, but they suffer because the score bug is too spread out. If I want to see the score and period/time left/shot clock I have to look left and then look all the way right to get the information. And because of the size of the bug, the in-line stats that pop up are too spread out, meaning I have to spend to long looking at the line to get the information at times. This is in stark contrast to the lower-3rd graphics they use to identify on-air talent in the studio, which is way too small and compact relative to the rest of the graphics package. 8. The graphics also suffer because they are designed outside the traditional NTSC safe title area. This is similar to the problem FOX Sports had when they started prodicing all of their events at a hi-def resolution: important information is cut off from viewers that have older televisions (approximately over 50% of TVs in use in the United States). This was especially frustrating during the selection show. When brackets were shown on the left side of the screen, the team seedings could not be seen. That's it for now. What do you think?